Phil Mickelson is playing in this week's Singapore Open and by his own admission, was a little taken back by both the quality of the field and the quality of the course. After the first day of play, three unknown players are tied for first place including Gavin Flint (Australia), Kane Webber (Australia) and Jim Park (USA). Angelo Que (Phillipines) is one stroke back. Mickelson is two strokes behind the leaders and tied with KJ Choi and Tetsuji Hiratsuka (Japan). 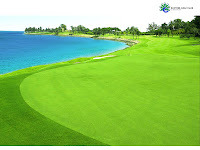 The event is being played at the par-71 Serapong Course at Sentosa Golf Club. The purse is $4 million and is Asia's biggest purse event. 0 Response to "Mickelson Struggling in Asia"